The days of our busy lives seem to fly by, and, before you know it, it's October 14th, National Chocolate-Covered Insects Day. There's no reason to panic or go buggy. If your gift list for this holiday is as long as your arm, then you might want to think about making these sweet, high-protein goodies yourself to save money and time pounding the pavement or wandering the Internet. Your friends and loved ones will know you care when you present them with an artfully arranged selection of carefully hand-dipped crickets, grasshoppers, ants or mealworms. Place mealworms, crickets or grasshoppers in the colander and cover with a screen or a large strainer to prevent insects from escaping. Rinse thoroughly and drain. Put the rinsed insects inside the freezer bag. Place bag in freezer for approximately 15 to 20 minutes. Preheat oven to 225 degrees. Cover the baking sheet with a single layer of paper towels. Distribute the insects evenly on the baking sheet. Place in preheated oven and bake for 1-1/2 hours. Remove the wings and legs of the roasted crickets and grasshoppers when cooled. Pour three-quarters of the semi-sweet chocolate pieces or chips in the microwave-safe bowl. Microwave on 50 percent power for one minute or until the chocolate begins to turn shiny. Add the remaining chips to the melting chocolate, stir with the spoon, and continue microwaving until shiny and melted. Don't overcook the chocolate or it becomes grainy. Dip individual roasted insects into the melted chocolate, working quickly before the chocolate firms. Place each chocolate-covered insect on a large sheet of wax paper until chocolate hardens. Refrigerate the chocolate-covered insects in a covered container where they can remain for up to three weeks. 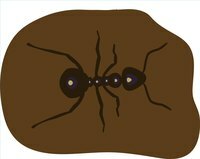 If using ants, place the bag of ants in the freezer, then slow-roast them and stir them gently into the melted chocolate before making individual chocolate drops. Do not rinse the ants, or you'll lose most of your main ingredient. Seek medical help if you experience any allergic reactions after eating chocolate-covered insects.